You are my favorite cheese of all cheeses. When we first met at the Nugget Market in Davis, California, I confess that I was seduced by your buttery deliciousness, your double cream texture, and wonderful flavor. 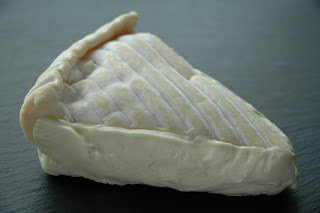 Other cheeses pale in comparison to your white mold-ripened surface and creamy center. To call you "brie" is like calling a diamond a rock. In fact you aren't a brie because of your novel ultrafiltration process. You are smoother, and so easy to spread on a cracker or slice of baguette. When I moved away to Minnesota, there you were, in the fancy cheese case at Byerly's supermarket. Oh what a delight to see such a long lost friend! You joined me for Oscar parties, cocktail hours, girls' nights, and holiday dinners. And when I moved back to California, I found you at the most unlikely place-our new "lifestyle" Safeway (and at Whole Foods and Lunardi's too). And thanks to a fellow admirer, you have now have a soulmate: Dalmation Fig Spread- which suits you so well. The sweetness of the spread made from handpicked figs brings our your flavor. I can hardly believe the scrumptiousness. So, thank you, dear Fromage D'Affinois for being so tasty. WORD!!! Although it's not my number 1, I LOVE it!! !